We stock a large range of Drain Bungs varying from 4” up to 24”. Standpipes are used to connect to the mains water supply by screwing the standpipe into an underground hydrant valve. 6 Piece Set. 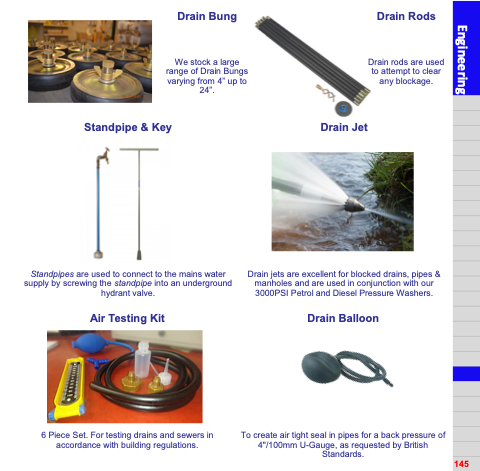 For testing drains and sewers in accordance with building regulations. Drain rods are used to attempt to clear any blockage. Drain jets are excellent for blocked drains, pipes & manholes and are used in conjunction with our 3000PSI Petrol and Diesel Pressure Washers. To create air tight seal in pipes for a back pressure of 4"/100mm U-Gauge, as requested by British Standards.